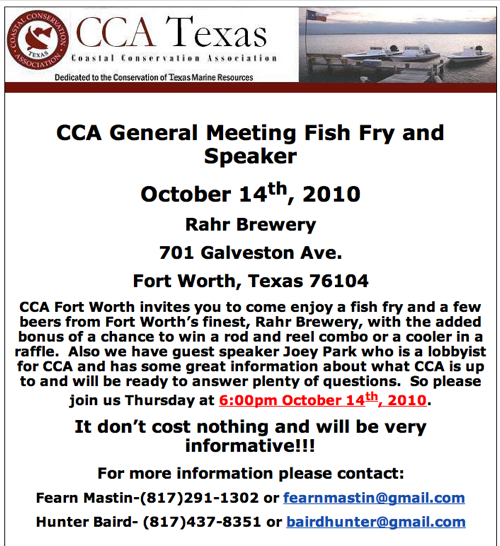 CCA Fort Worth invites you to come enjoy a fish fry and a few beers from Fort Worth’s finest, Rahr Brewery, with the added bonus of a chance to win a rod and reel combo or a cooler in a raffle. Also we have guest speaker Joey Park who is a lobbyist for CCA and has some great information about what CCA is up to and will be ready to answer plenty of questions. So please join us Thursday at 6:00pm October 14th, 2010.